Compared with brisk walking, swimming allows you to meet your fitness goals with less stress on your joints and muscles. In terms of convenience, it’s hard to beat brisk walking as a form of exercise. You don’t need any special equipment or venue, and most people can do it. But for some people—such as those with achy knees, sore hips, or substantial weight—walking may be uncomfortable. And during the winter, harsh weather in many parts of the country can make walking outdoors unpleasant—even treacherous at times. A water workout in a warm indoor pool, followed by a relaxing sauna could be an appealing alternative that’s also good for your heart. 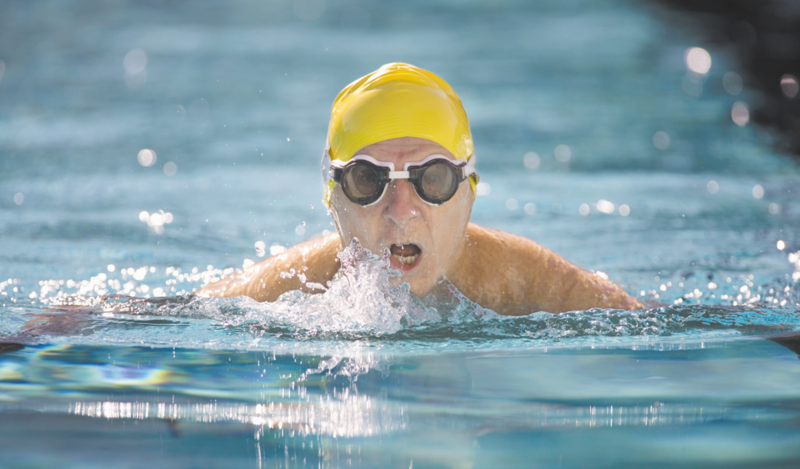 Relatively few people swim on a regular basis, so large studies looking at the benefits of physical activity in relation to cardiovascular health have tended to lump swimming together with other types of exercise. Plenty of evidence points to lower rates of heart disease among people who do regular, moderate-to-vigorous-intensity exercise—and swimming laps definitely fits the bill. “Recreational swimming will burn about the same calories as brisk walking,” says Dr. I-Min Lee, a professor of medicine at Harvard Medical School who studies the role of physical activity in disease prevention. One key advantage to swimming is that water makes you buoyant, which take the stress off your joints. That can be especially helpful for people who are carrying excess weight, she explains. Water also offers resistance as you move through it, which allows you to work out vigorously (if you’re able) with little chance of injury. Swimming laps can also be relaxing and meditative, which may offer some stress relief, adding to its cardiovascular benefits. Finally, swimming is an activity you can do across the life span. If you haven’t been swimming in a while, start slowly. Try swimming just five to 10 minutes of laps while coordinating your breathing, strokes, and kicking. A pair of well-fitting goggles is a must. If doing laps isn’t your thing, you can try walking or running in water. Another option is water aerobics, which are exercises done in waist-deep or higher water that may use floating devices and weights. Many community centers, YMCAs, and other facilities with pools offer these classes. One downside to swimming is that it’s not optimal for building bones because it’s not weight-bearing. That’s why swimmers need to supplement their aquatic training with some weight-bearing exercise, like strength training, walking, dancing, stair climbing, or gardening. Saunas: A healthier heart and longer life? Visiting a fitness center with a pool may come with an added bonus for your heart: a chance to use a sauna. The hot, dry air inside a wood-lined room of a sauna can provide a relaxing rest. But it may also offer some cardiovascular conditioning because the high temperature boosts your heart rate. Taking a sauna may also lower blood pressure, and some research suggests that regular sauna use may benefit people with risk factors for heart disease, such as high cholesterol and diabetes. Last year, a study from Finland, where saunas are deeply embedded in the culture, found that middle-aged men who took more frequent saunas (four to seven times per week) live longer than once-per-week users. In particular, more time spent in the sauna was linked to a lower risk of dying of cardiovascular disease. On average, the men in the study spent 14 minutes per visit basking in the 175° F heat. As an editorial accompanying the study points out, it’s not clear whether the benefits arise from the dry heat, the relaxation time, the leisure of a life that allows for more relaxation time, or the camaraderie of the sauna. Saunas seem to be safe for people with stable heart disease and even mild heart failure. But people with unstable chest pain (angina), poorly controlled high blood pressure, low blood pressure, or other serious heart issues should avoid saunas. Don’t stay in longer than 15 to 20 minutes. Cool down gradually afterward; don’t go straight outdoors in cold weather. Drink two to four glasses of water afterward to replenish fluid lost from sweating. Avoid alcohol before and after your sauna.